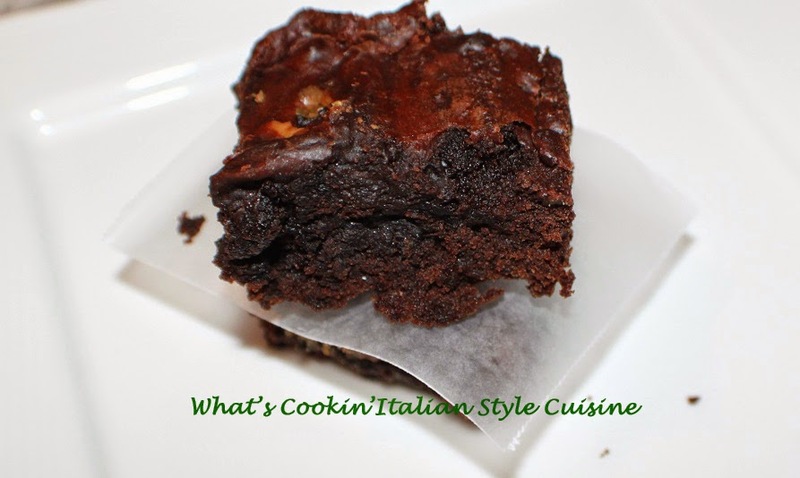 I have been wanting to make a brownie with espresso powder in it, then I kept searching for a great recipe and my favorite baker +Liz Berg from That Skinny Chick Can Bake came up on the net first and I was thrilled to try it knowing they had to be awesome! Well they didn't fail me at all, actually they were fabulous and I want to thank Liz for this awesome recipe from 2010 when she first posted it! Go check her site out your going to love everything she makes! I just adapted it a tiny bit. Heat oven to 425 degrees. Line a 13x9 pan with parchment paper or heavy spray with cooking oil. Melt the butter and the chocolate in the microwave stirring every 30 seconds until smooth around 2 minutes. In a large bowl beat the eggs, sugars, extract, coffee and espresso powder and using an electric mixer place on high for 10 minutes. Add the chocolate mixture to combine. Stir in the flour and salt (using a spatula )only until blended. Pour into a prepared pan and bake for 15 minutes. Lightly cover with foil and bake another 15 minutes. Cool completely before cutting. Store in a tight covered container. Note: I drizzled melted german chocolate over the tops of these. Thanks +Liz Berg these were great! I absolutely love espresso powder for baking! It's such a fun ingredient...and it packs a ton of flavor! Can't wait to try this brownie recipe now that baking season is almost here again! I love the depth that espresso adds to brownies. Will save this because every once in a while I wake up and tell myself "must make brownies." And I do. Love Liz's blog also.